It has been 3 years since the Fuji Speedway has been the platform for the NISMO Festival. The standard agendas the Option team follow is to cover the GT-Rs and the Silvias. However, our sights have shifted towards the battle of the Z33 and V35 from this event. There has never been a venue like this before; where 12 of Japan's best tuned Z33 and V35 are modified within the given regulations for a head to head showdown. Snow started to fall before the race began, but there was nothing that could stop these cars now. All the participants successfully ran, the only regret being that the final parade run had been cancelled. Today, the different VQ35 platforms tuned by various tuning shops are reviewed in this feature. The key to the speed is an increased displacement and a fully tuned suspension. This machine is virtually equal to a race tire equipped machine trapping in at 1 min 54 sec! 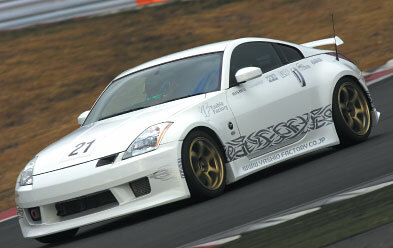 Autech Tsukada led its BNR32 demo car to its victory at the 2002 Nismo Festival Tuners Battle, and this time with their Z33. They have succeeded in displaying exceptional speed and intensity once again. 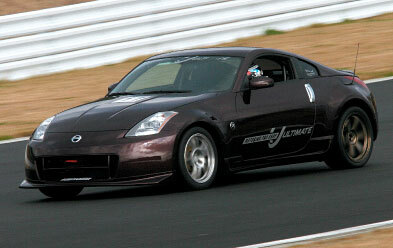 Centering on their engine build up, they used Nismo components similar to the other Z33 that entered. What sets the Autech Tsukada engine apart from the rest is that they have eliminated the electric throttle function and fabricated a throttle body from an Infinity unit. This is an all familiar tuning style of ATTKD. "I don't like the stock throttle system since it uses the engine braking technique after letting off the gas pedal. I don't know how to reprogram stock ECUs therefore we fabricated the cable-type throttle system and installed a FCon Vpro. Now we can eliminate the AFM as well." Claims the shop manager. The shop gained its knowledge of eliminating the air flow sensor and tuning Fcon Vpro standalone ECUs by modifying many GT-Rs. The Vpro is chosen by many tuners to control the fuel management, ignition timing, eliminating the speed limiter, and increasing the rev limit to name the least. An Amuse High Tech Rom controlled the VTC aspect of the VQ35 engine for this particular setup. Their suspension setup is also to be acknowledged. Their custom coilover setup called "Senkyaku" modifies the rear suspension into coilover units enabling a wide range of setting ranges. The suspension setup improves the overall handling during cornering providing the much needed stability. The driver Kinoshita claims "The car is balanced very well. The performance resembles that of a machine that is between a high grip S-tired car and a GT300 machine." 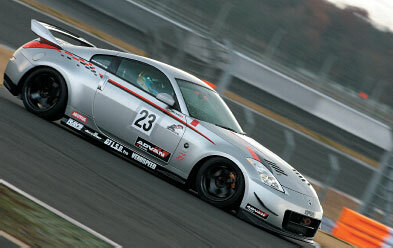 His comments were just as expected, backing up the performance expectations of the Autech Tsukada Z33. The stock intake manifold' s capacity was increased by installing Esprit's intake spacer. The air flow transition between the surge tank and the head is manipulated by the funnel structured spacer; providing a smooth air flow. By simply installing this spacer, the engine spins as equal to the anniversary Z edition at 8000 rpms. The Surge tank manifold was modified for an Infiniti throttle body. The throttle butterfly increased from 70mm to 80mm, a 30% larger surface area. To gain more efficiency, a modified surge tank and the elimination of the air flow sensor was adopted. An external bumper duct was constructed to direct the fresh air directly to the air intake filter. The owner claims "it serves as a ram air function at thigh speeds." The rear suspension was converted to a coilover system. 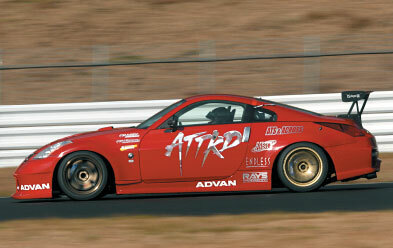 The ATTKD' s Senkyaku suspension performs well in any condition especially at the race tracks. First, they chose a kit that incorporated an external reservoir gas shock tank, but at the end decided to go with the basic damper type. Looking underneath the driver' s side door, the flat diffuser looks as so. The flat diffuser panel stretches across the rear up to start of the rear wheel wells. Behind that, the flat panel stretches even further across the entire chassis. An Engine Built Solely to Decrease Lap Times! The Parts were Chosen with Their Long History of VQ35 Experience! Amuse had started to modify and tune the VQ35 engines very early after its production and had gained valuable expertise in result. The team had many ideas on what kind of engine to build for the Tuners Battle. Mt. Tanabe finally chose an engine that was a perfect match for the Fuji Speedway track. The motor consisted of a Nismo Spec 1 high compression head assembly that was slightly customized just for Fuji. Every one of the tuners have their personal preference when in regards to choosing an intake manifold. Although Amuse knew that this was a disadvantage on the straightway, they chose a stock intake manifold for more torque at the mid-range rpm range. The reason why they decided not to go with the high-rpm 35th anniversary intake manifold is because after long testing at Fuji, they knew that the most effective section of the course to be the fastest at was the technical section. However, with this setup, the power decline after the peak rpm was too much. For this reason, the engine was further custom modified to raise the peak power to 6400 rpms. Now compared to the other machines, theirs required less time to reach the top speed at the straight section. Amuse had also emphasized on the cooling factors of the machine, fabricating custom GT style ducts on their front bumper. Unfortunately, the cooling capabilities of the vehicle were not recognized because the final race was cancelled due to rain. The shop original front bumper received a widened mouth and a GT car like separate ducts. With the combination of the vented hood, the engine cooling aspects were well taken care of. 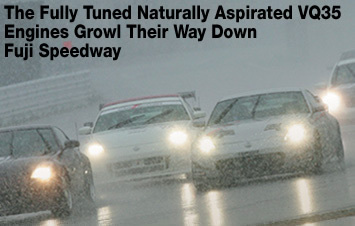 The dampening force was increased just for the flat and high speed aspects of the Fuji Speedway. This raised the stability of the vehicle, but at the same time, decreased the turning capabilities. To fight this, the front spring rates were dropped 4kg/mm more. Mr. Tanabe claims "I thought I dropped it too much, but turned out just right." Nismo is currently preparing 2 versions of their tuned engines, the Sports Package and the S1 package. However, the R1 package that is being developed right now reigns superior over both setups. 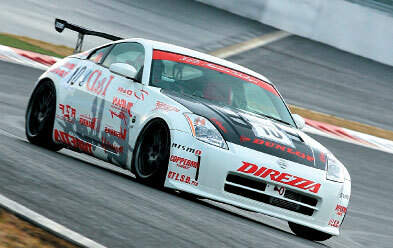 The Z33 built for this race today at the Fuji Speedway was equipped with this competitive setup which its intake and exhaust components were still under research and development. Other part still under development is the throttle body which received an increased butterfly area to decrease air flow resistance and was matched up with the intake piping diameter. Although the naturally aspirated research for these motors were still rudimentary, the prototype exhaust that was fitted on to the setup. After testing, 1-2 horsepower was gained with the custom throttle body setup and an additional 4-5 horsepower gain with the prototype exhaust manifold. The opinions on whether or not this was a large achievement varies from person to person. Furthermore, Nismo is a brand known not to produce extremely ridiculous horsepower gains, but a mild improvement with emphasis on reliability and longevity. 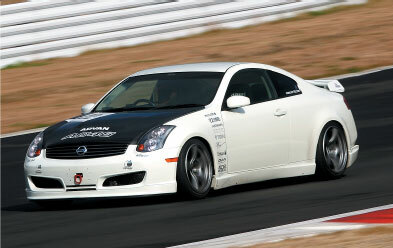 Nismo is considered to be the head of the Z33 tuning scene and they hold the key to the future of the VQ35 tuning. The modifications emphasized on the B turn on the Fuji Speedway. From the B turn to the S turn, the machine was setup to excel at this area. Although the torque level was a bit shy of their expectations, the car produced 340hp on a Dynapack. Nismo's line of Weldina cat-back muffler system was installed for this setup. Along with this, a Nismo titanium muffler was combined. The suspension damper setup is a Nismo R1 prototype model. This component may be the first to hit the market than the other parts that are in development. Nismo front upper arms and bushings were also used. Though the R1 setup is made purely for racing, the car was still expected to be daily driven. The R1 version retains an R-Tune logo on the optional center monitor unit when the ignition is turned on. Headers and Camshaft Designed Exclusively for the Fuji Circuit will Hit the Market Soon! The Endless colored Z33 was built by Tomei Powered, specifically by RS Nakaharu, who maintains the Z during the Super GT and the S series races. The vehicle also was a special project car used on the Tokyo television show, "Car Hyper". The engine was centered in with parts mainly from Tomei such as camshafts, valve springs, connecting rods, and headers. Some Nismo components were used as well. The key modifications were the combination camshafts and the exhaust manifold, tuned for the long straightway and high average speed of the Fuji Speedway. The biggest camshafts that Tomei produces for the VQ35 are the 268 degree specs which were not sufficient for the modified cylinder head and the 13.0:1 compression. Because of this, an IN280 and EX272 degree camshafts were prepared for this setup. Like the valvetrain assembly, the exhaust manifold were designed for a high revving engine. The manifold was modified so the junction point of the tubes were shortened and the overall structure was altered for their targeted performance. Their exhaust manifold that is on the market today is made to bring out the peak power at 4000 - 5000 rpms. However, their custom fabricated unit built just for the Fuji Speedway is marked above 5000 rpms for the best performance. These custom components are in the research stages as of now and depending on the results, it will be released to the consumer market. With parts like these, the VQ35 tuning is constantly evolving. The prototype cams and the headers were built to withdrawal top end performance. 370cc injectors at 70-80% were installed as a safety measure since the stock units require to be used 100%. The ECU has been reprogrammed by Tomei. The stock compression at 10.3:1 was a sufficient match with the 268 degree camshafts, but not enough for the 13:1 ratio. Here, an IN280 and EX272 were installed to meet the high compression. Since these camshafts do not require alteration of the valve timing, the VTC was untouched. RS Nakaharu has vast experiences when it comes to Zeal suspension components along with X Coils used in the S Series Races. These carry a great reputation of stability and flexibility. The arms remain stock. The Potential of the VQ35 Can be Extracted from ECU Tuning! The Yashio Factory Z was built entirely with Nismo engine components, and compared to the others it represents a standard tuning style. The engine was assembled with no insight of the new Fuji Speedway track layout since it was still being renovated at the time. Blindly entering this race, they decided to use a 35th anniversary intake manifold to unleash the top end performance of the engine. The vehicle pulled a 300.1 hp on the dyno. To produce these numbers, not only did Yashio Factory fully build the engine, but thoroughly focused on tuning the engine management computer. Data was collected after many hours of testing but the engine first only pulled 248 hp. Oka-chan of Yashio Factory claimed that these numbers were far too low to compete with the rest. After extensive tuning of the ECU, the power output increased progressively. Oka-chan then claimed that "Silvias are fun but the Zs are just as fun.". According to the driver, the new unfamiliar track layout was the main reason for the poor lap times. The car was also built for daily driven reliability to begin with. It's unfortunate that the machine could not clock in under 2 minutes but with a few more practice laps, it would've sure been one of the top machines. Some future plans for this machine is to reinstall the stock intake manifold and tune the engine to bring out the mid-range torque. The engine internals is made up of mostly Nismo components. These components have been carefully chosen and matched. Oka-chan had succeeded in producing 50 extra horses with just the ECU tuning alone. 2kg/mm more was added to the front and rear springs than the previous setup. A 2 way LSD was also equipped for this high speed course. The car weighed in at 1470kg with 60 liters of gasoline. "I could've shaved off more weight but this should be enough." Claims Oka-chan. The Legendary Driver of the Z Had been Producing High Quality Prototype Components! Central 20 has been releasing various tuning parts for the Z33, they even have a bolt on turbo kit for this application. Forced induction is not permitted according to this race's regulations, so a naturally aspirated high compression motor was built. The parts that the legendary "Yanagida Z" builds are not only very durable but beautiful as well. The simple and clean engine bay looks too much of a waste to thrash around a race track. The suspension had been modified for the high speed track and is still applicable for regular street driving. This street vehicle built by Central showed no signs of fatigue or over heating after hard, continuous laps. It was rumored that this car had performed the most laps around the track including the practice sessions. During these laps, the vehicle often trapped in under 2 minutes several consecutive times. The vehicle's strongest trait is that it can keep running at an extreme rate and still maintain its reliability. The head, pistons, and the connecting rods are still under R&D, but there exists a chance that these will be released to the public soon. Another key modification is that the 35th anniversary intake manifold brings out the top end power while the 4.3 final gear ratio firmly keeps the powerband in check. With this, the rpms can be kept up at the technical portion of the course. The major appeal Central was attempting to make was that a reliable street car that can keep up with the rest. The first thing noticeable when opening the hood is the custom engine cover and the prototype intake piping. A hose is directed from the bumper duct to provide fresh air to the intake. The custom suspension is made up of Endless components. The custom brake setup is a 6 pot and a 4 pot unit. A couple of gauges are installed to monitor the engine data for a streetable setup. This machine combined with the best driver will surely produce some great times. Achieved a Spectacular Time Using its Giant Front Air Duct! The Engine Built by None Other than Nismo Omori Branch! Quickly Overcoming Issues During Testing! This vehicle is equipped with an engine built exclusively from Nismo Omori Factory Branch. The high compression motor was fitted with a reworked Nismo Spec 2 head, Pistons, Connecting Rods, and a throttle body. A Tomei header was also used. The engine showed no signs of backing down during testing but during the shakedown run, it could not produce great lap times. Soon after, the differential oil started to pour out of the rear. During the short time period they were given to remedy this problem, the leak was fixed and a differential cooler was installed as well as the suspension was reset to another setting. Finally the machine was able to display a great time and was able to rank in at 4th at the qualifying. According to Mr. Kikuchi the driver, the suspension never lost its flexibility even after the spring rate was set higher. This is because the bushings have been upgraded to provide stability to further reinforce the high grip characteristics of the S tires. Along with all the components a professional tuner had chosen and the potential of the Zele, this collaboration produced great results. This engine was tuned exclusively by the Nismo Omori Branch. The custom muffler produced a screaming naturally aspirated sound that appealed the serious nature of the engine. 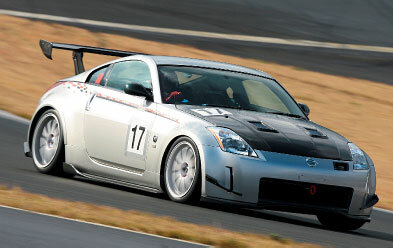 The Z33s are known to run very hot especially at race tracks. Therefore Nismo had installed an upgraded aluminum radiator and an oil cooler. During testing, they had even installed a differential cooler. A Mine's suspension was chosen for this setup. It consists of Ohlins shocks and Eibach springs for a smooth movement. This Lightly Tuned Machine Has Great Potential to Morph into a Beast! 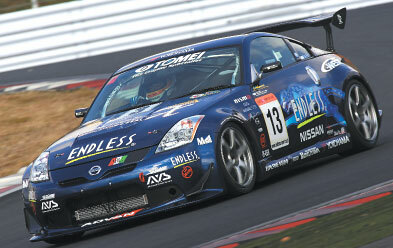 Sun Line is known to have built the S15 which trapped in at 58 seconds at Tsukuba, and 1 min. 35 sec. at the Okayama International Circuit. 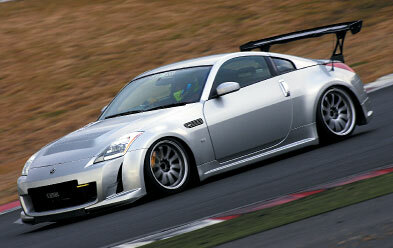 Mr. Sato, the shop manager claims that Sunline had focused too much on the S15 and not enough of the Z33. The light modifications performed for now were the Tomei camshafts, strengthened valve springs, intake/exhaust modifications, and Vpro tuning. However, Sun Line is kept busy with their S15 and did not have enough time to install the parts they had planned on. These include Nismo Spec2 head & camshafts, pistons, Tomei connecting rods, and the 35th anniversary crankshaft are all balanced into a monster engine. In order to build this engine and tune it properly, they realized that they don't have enough time. And if the tuning isn't done properly, they did not want to take the risk of blowing up their creation. The exterior is too, still under construction. Sun Line decided to slap on the carbon fiber components for the GT car look. The vehicle is even planned to make a showing at he next Tokyo Auto Salon. The ultimate goal of this vehicle is a streetable machine, unlike the S15, which was made solely for the race track. 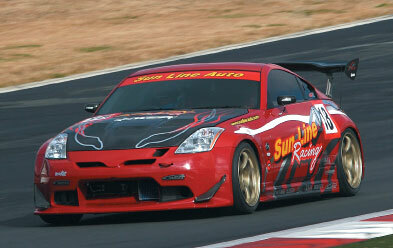 You can be sure that you'll be seeing many of Sun Line's vehicle tearing up the race tracks in the future. The VQ35 is known to lose power because of its restrictive exhaust system. Because of this fact, camshafts, valvetrain, and the right exhaust manifold were combined to make 330 hp on a dynamometer. An oil cooler is relatively not necessary on the streets but at a race track, it is an absolute must. This particular unit slightly lacks capacity for long race tracks like the Fuji Speedway. After testing many combinations of suspension setups, the smoothest operating match ended up to be the Function V6 with the X Coil. This Race was Only for Practice. Next Time the Real Potential is Exposed! 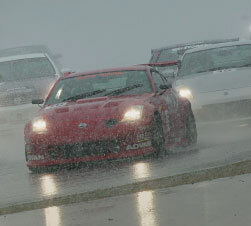 I&D is involved in many types of racing such as Circuit racing, drag, and drift. They believe that it is essential to consider customer feedback from these motor sports. This is the same reason why they decided to compete in the Tuning Car battle. Considering the standpoint of the general consumer, I&D did not use products such as the Nismo Spec 2 head and camshafts because they are not available on the market yet. They emphasized their tuning with parts that were readily available to any average joe. Therefore, the parts used to make up this machine includes a ported Nismo Spec 1 head and IN/EX 272 deg camshafts. 306 horsepower was produced all because of the ported cylinder head assembly. The power is realized from the mid-range to the upper range. This is the first time I&D has ever put this much time and effort into building a Z33. Their shakedown run consisted of only a few laps around the Tsukuba before the event. The engine, suspension, and body are still in its development stages. Even so, they were able to grasp a 2 min 2 sec mark. We are enthused to see what kind of times this vehicle can produce once the development is finished. The first components modified in this machine were the intake manifold and the surge tank. The manifold was port matched and smoothened because forced induction was against regulations. The custom circuit spec suspension which was jointly developed by I&D and AP Engineering. The understeer could not been ignored during the qualifying run, so the vehicle height was adjusted to minimize it. The GT Wing is a Must! I&D equips their S13, JZX100, and al their demo cars with a GT wing. The wing effectively provided traction at the turns but too much wind resistance at the straightway. The top speed has not really improved because of this wing. US Spec Left Hand Drive Machine with a Twin Throttle Setup! Throttle Bodies on Both Sides! Ultimate had brought in their machine, which to our surprise, was a US spec left hand drive version. But the surprise didn't stop there. After revealing the engine bay, it blew us away. Under the hood, there was two throttle bodies extending from the intake manifold. This was a twin throttle body setup, along with twin air flow meters. "a single throttle body is not sufficient for a 3.5 liter displacement engine especially at the higher rpm levels. By incorporating two throttle bodies, the air intake should be more than enough. Plus, I wanted to do something unique." Claims Mr. Takakamo. The custom surge tank was fabricated to fit the twin throttle bodies. Stock throttle bodies and a air flow meter are each installed on the pipings. Since the ECU is stock, and the voltage was split from 0-5 volts to 2.5 volts each on the air flow meter, the injectors operate at half its capability at full throttle. Because of this, Nismo 480cc injectors were installed to make up for the lack of fuel. The vehicle was completed right before the event. It's surprising that it even runs this well. The future of this machine should have lots of potential. When people see the town throttle system, the first thing they mention is the VG30. That's not the case here. Although it looks the same, the performance greatly differs. The intake pipes are custom units from Ultimate. The base is a stock surge tank unit. Not only is this just split up into two pipes, but a funnel system was properly designed for fresh air to each of the cylinders. The cover was raised 30mm to increase capacity. The left angled custom titanium muffler produces a very aggressive look of the vehicle. The exhaust system sports a 94mm main piping underneath, along side with the differential oil cooler. They Came to Battle Outfitted with Nismo Parts! The Results are Evident! "I was initially going with the Nismo Spec2 head and camshafts, with our shop pistons and rods. But I thought that everyone was going with this combination so it would have been boring." Claims Mr. Fujioka. The shop original pistons were unable to be prepared in time, so they went along with the Nismo S Race parts instead. There was no time to modify the head, so the shop had brought whatever machine they had ready at that point. On the dyno, it pulled 290 hp at 267 ft/lbs of torque. Mr. Fujioka was aiming for over 300 but this was the machine's limit. However, Boss gained great insight by enrolling in this race. They realized that by changing to the 35th anniversary intake manifold in the future, the large front bumper opening would easily direct fresh air to the motor, producing well over 300 horses. Furthermore, by increasing the diameter of the throttle body from 47mm to 50, more power can be unleashed. The top end performance should be increased once those modifications are performed. However, the midrange will suffer because of this, so they are planning to add custom pistons and rods to the setup to increase response. The Boss Z33 has great potential in the future races. The connecting rod and the crankshaft bearings remain stock. Other than that, Nismo and other parts are combined. The next step is to change the intake manifold. Fujioka claims that with over 300 horses, a turbo'ed car cannot even come close. The custom full titanium muffler has a 76.3mm main piping and increases the power and torque drastically. The titanium muffler sound is a absolute must have for a N/A machine. The suspension consists of Prodrive coilover kit with the spring rate of 13kg/mm. Fujioka worries that if the rear are switched to coilover units, the weight load will change dramatically, thus still using the stock rear suspension setup. The shocks are 16 way adjustable. Traditional but Effective NA Tuning! This MCR V35 was built to defeat the Porsche GT3. This theme was introduced first in the Option Magazine. This machine was the only machine that entered as a V35. The engine consists of full Nismo internals. Not only did MCR use these highly prized parts, but decided to hone the cylinder head, blueprint and balance, modified the valve guides, just to name a few. The tuning level of this engine is above the rest, possibly the best one out there. This superior performance machine pulled a whopping 328 horses on the Dynapack. "The suspension was very difficult to set. " clams Kobayashi from MCR. The rear suspension is a stock layout where the spring and the shock are not together as one, and a 16kg/mm spring was the limit for this setup. However, this vehicle has a wheel base that is 20cm longer than the Z33 and the front and rear tread are 35cm smaller. At the 100R turn and the S turn section, this machine shall be above the Z33. 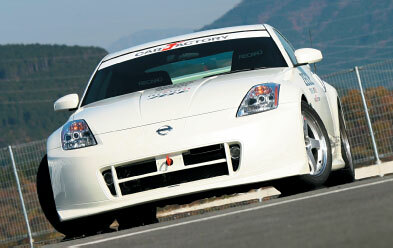 Knowing that the V35 is still a very good competitor against the Z33, MCR had brought out a serious machine. Tons of work like adjusting the weight of pistons and connecting rods, adjusting the clearance of piston rings, cutting the valve seat, and more custom fabrication were done. There were too much to list. There is a 7kg/mm margin of safety when using the 16kg/mm springs on this setup. Here, a coilover setup was installed, increasing the spring rate setting range. 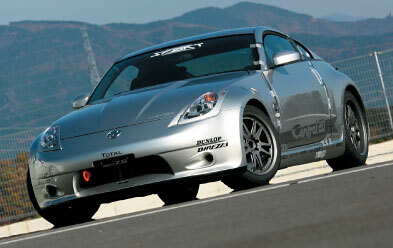 A Tein Super Racing suspension kit were installed after modifying the Tein Type CS MCR version. The suspension sports a separate gas shock tank system and can be set to 20 different levels. MCR's weight reduction style is to shed the weight while still retaining the stock interior. This is their policy and have been sticking with it for many races. The airbags have been removed and the Carbon FRP seats were installed to weigh in at 3200 lbs.